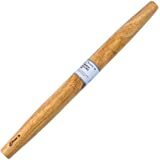 Sold by Hight Quality life and Fulfilled by Amazon. Gift-wrap available. 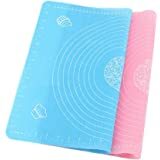 SUPER KITCHEN GUARANTEE:This High Quality mat can be used more than 5 years .There are an instruction and hair elastic as a GIFT.This premium mat is perfect to give as gift .SUPER KITCHEN guarantee that you don't need any reason to refund this mat!! 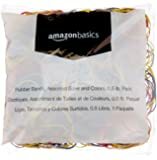 Sold by Hight Quality life and ships from Amazon Fulfillment. Sold by Virtuosoul LLC and ships from Amazon Fulfillment. Why Folksy Super Kitchen? Safe, Durable, Premium Quality & Beautiful Design. 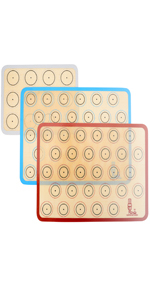 We are professional to provide the food grade silicone products with the highest quality. 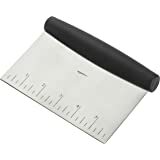 The double thickness design is more durable and lays flat and grips the counter top well. 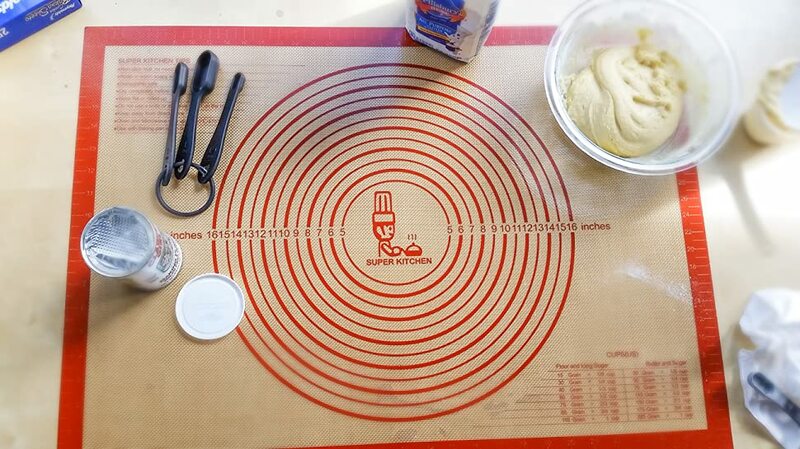 Super Kitchen mat has stood the test of time with use by the chefs. 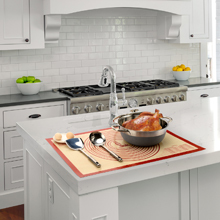 We are professional to offer the food grade silicone products.It is made of fiberglass mesh and the highest quality food grade silicone.The double thickness design is more durable and lays very flat and grips the counter top well.Folksy Super Kitchen mat has stood the test of time with use by the chefs. 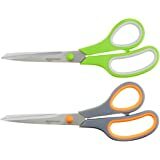 --Highest Food Grade Silicone and BPA-FREE. No need to worry the cookie cutters will damage the mat. 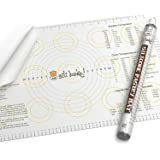 Our mats are great for working with sticky materials.It is much easy to roll out the dough, pie, pizza crust,brand,homemade biscuits and cookie dough. It lays perfectly flat and won’t curl around the edges.Mats are 20*28 inches and 0.7 MM thickness.It always keep stable on the table.No need to worry the mat will move when rolling.Mat is perfect to be pastry mat,counter mat,pizza mat,placement mat and kids mat and so on. 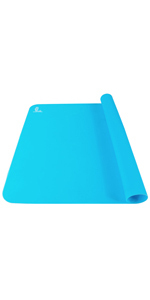 There is a hair-tie with this mat.It helps you to store this mat easily. 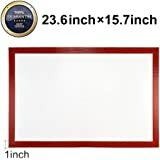 In order to solve the problem that the pastry mat is easy to slip when rolling out, Folksy Super Kitchen mat is designed to be large(20×28Inch) and thick(0.7MM) size with the great friction on the back and grips the counter top well. 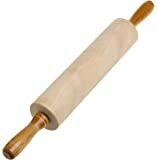 It is super hard to move as you roll out the dough and always keep stable on the table. 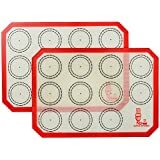 Super Kitchen mat is also perfect to be pastry mat, counter mat, pizza mat, placement mat, kids mat and so on. 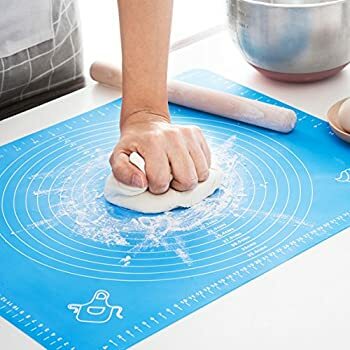 This mat is made of food grade silicone and great for working with sticky materials, so you can enjoy the best NON-STICK baking mat if you have it now. It is much easy to roll out the dough, pie, pizza crust, bread, homemade biscuits and cookie dough. 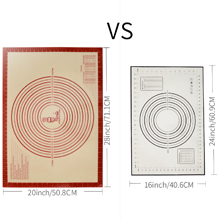 Folksy Super Kitchen mat is larger size 71*51cm(28*20inch) than the other mats 60*40cm (24*16inch) on the market. 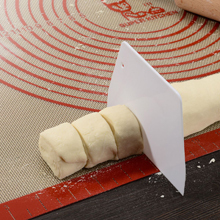 It gives you larger area to roll out the dough and prevent the flour from falling to the ground and splashing everywhere. It is very convenient!!! More Heavy and Durable Design! Folksy Super kitchen mat is more heavy and strong than the other mats on the market. 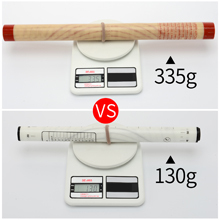 The weight of our mat is around 335g and the other mats are around 130g on the market. It lays perfectly flat and won't curl around the edges. 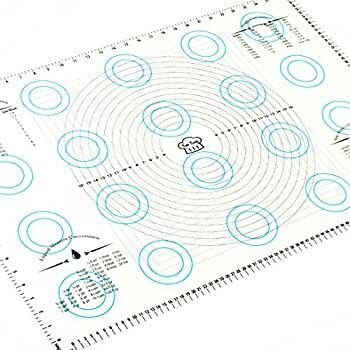 The measurement design of this mat is so convenient. 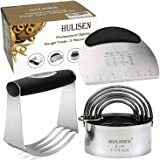 You can use it to make food of different sizes accurately. It depends on your preference. No more scrubbing! Even burnt sugar and fat falls off on its on. Just rinse the mat in warm soapy water to clean it and dishwasher safe. 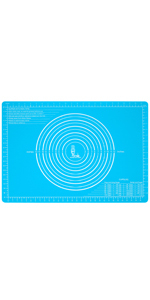 This is an antibacterial, double thickness and heat resistant silicone mat. Help you to keep your countertop clean and protect your countertop easily. 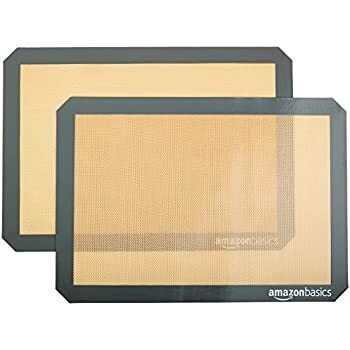 This is an extra large and a double thickness mat. 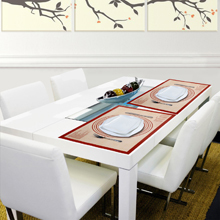 It is good to be table/placement/art mat..
Easy to Store & Perfect as A Gift! There is a hair elastic as a gift. It helps you to store this mat easily. This premium mat is also perfect to give as gift. 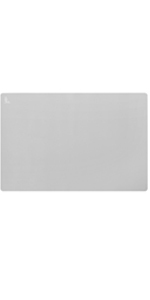 SUPER KITCHEN believe that you don't need any reason to refund this mat! 5.0 out of 5 starsWell made! This mat just arrived today and though I washed it, I haven't got to use it yet. I was really pleased with look and feel of it. 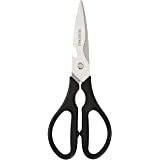 I think about the one my Mom used, a nylon plastic one, and how this new one I have seems so much better. If she were still with us, I would love to give her one of these too. 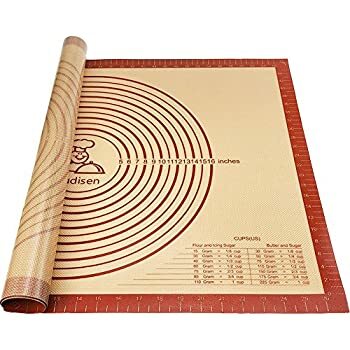 This mat is not flimsy and it's not paper thin either. It's thicker and it seems well made and grips the countertop very well, so I won't have to chase it all over while I use it. I'm looking forward to trying it out soon. 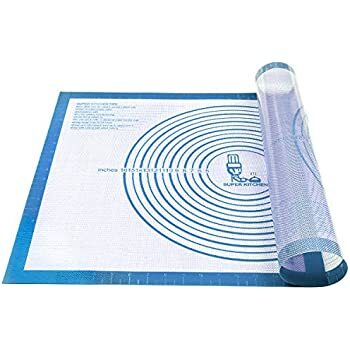 5.0 out of 5 starsPies, bread, etc - perfect mat! I had a hard plastic pie mat that broke recently. This was purchased as a replacement. It's easier to use and nothing sticks to it! 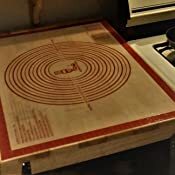 I've already made pizza crusts, bread, and 2 apple pies using this mat. I like the guides and the size of it. It doesn't slide around like my old mat. I'm still figuring out the most efficient way to clean it and think wiping it off with some soapy water and then rinsing it/wiping it with a sponge or cloth while it's flat is the easiest way. The other way is in the sink & then rolling it with a dishtowel in it to dry it. 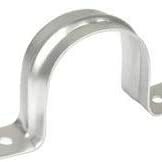 I like that it rolls up for storage and has a band to hold it closed - if you lose it, a clean rubber band works. I still put some flour on it when I'm rolling a stickier dough, but have no problems with sticking. LOVE IT! 5.0 out of 5 starsA Must Have for Bakers. 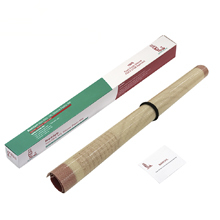 If you work with pastry dough often, or any type dough, you definitely need this. 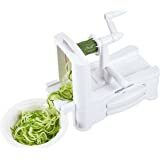 It makes rolling out dough so much easier and saves on clean up of your counter. With the addition of just a little flour, dough does but stick to the mat. The sizing rings are very helpful. This mat is quite large and for that reason, it is a bit cumbersome to clean and dry. But overall, that’s not a problem. To store it, I simply roll it up and secure it with the thick fabric covered elastic band that came with it. I’m so glad I finally bought one of these. Heavy weight with markings in inches rather than cm. 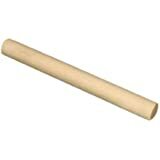 I keep mine rolled with a parchment paper liner and a Velcro band around it. I have found that I can prevent any slippage by wiping my table with a damp cloth before unrolling the mat. 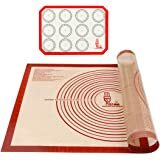 I have only used this for rolling dough, not as a baking sheet liner. At these dimensions it is a nice large, uncrowned work surface for working dough. 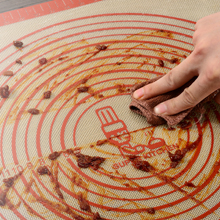 The surface can be dragged with a pastry scrapper to clean most of the surface. It’s so large I have no idea how it work in a dishwasher though it is dishwasher safe. I put mine in a sink of hot soapy water then drape it over a strainer to dry after blotting it on a dish towel. I hate having to deal with the mess of flour when rolling out pastry or cookie dough so I was excited when I read the product info that said even the stickiest dough would come off easily. I really wanted that to be true but unfortunately it was not. The first time I used the mat I rolled out pastry crust and it stuck so badly I had to scrape it off and start over. 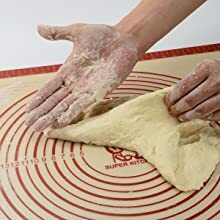 The only way to have the crust come off easily was to put quite a bit of flour on the surface of the mat, the same thing happened with cookie dough. About the only positive things I can say is that the mat doesn't slip and it washes up great. As long as I have to use flour to roll out dough and pastry I'm going back to using a pastry cloth. When I get bored, I'll sometimes bake something. A mat like this is invaluable. It's large enough to allow me to work on out granite countertop without getting flour everywhere. Sticky dough will still stick to it, but a thin layer of flour acts like a release agent. It's too large for my baking sheets, but I have other mats for that...this does what it was intended to do, which is keep the counter relatively clean. 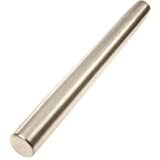 It has enough friction to keep it in place while I work and rolls up easily when I'm done. 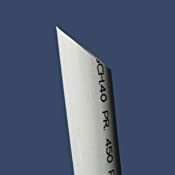 A word of caution, though...it's soft and will cut if you use a knife on it. So don't. 5.0 out of 5 starsEverything I hoped for, and more! If I could give 10 stars, I would! This is EXACTLY what I was looking for!!! 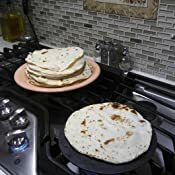 I love making pastries and breads, but my countertop is tile. I thought about buying a marble slab, but that would be heavy and awkward and storage would be a problem. This product is perfect!!!!! It doesn't slip and slide on the counter, it's easy to clean AND easy to store. The measurements are wonderful! 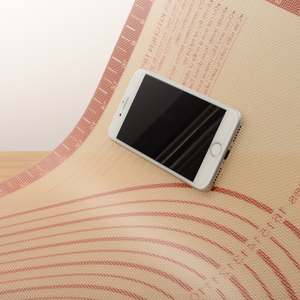 No more kitchen tape measure needed. I can't see a single thing I don't like about it! My grandson is trying to buy a house right now and when he does, I plan on getting him one of these mats. Anyone who loves to bake, will love this! This is a great, versatile product! 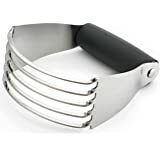 It is a perfect surface for rolling out pastry or biscuit dough, also would work for donuts using two cookie cutters of different sizes. 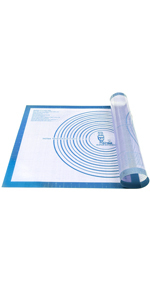 It makes a fine counter protector, is sturdy yet flexible and the various measurements printed on the mat are so useful. Don't use a heavy hand when using the cutters, you don't want to risk damaging the surface. It is easy to clean, although a little awkward if you have a small sink! Altogether, the mat is a very useful addition to any kitchen and I am very happy with it.